Recorded music sales in America plunged another 7% to about $6.2 billion last year as the sharp 16% drop in CD revenue more than offset gains in digital-media sales, according to a report released this week by consultant Strategy Analytics. Overall sales fell despite the fact that far fewer people are illegally downloading music tracks through peer-to-peer services than did a few years ago, according to a separate report. Digital music sales will overtake CD sales for the first time next year as more people switch over to iTunes and MP3 files. CD spending in the U.S. will fall $1 billion this year to $2.7 billion, while online music sales will hit $2.8 billion. By 2015, single-track downloads will represent about 40% of online-music revenues, followed by album downloads (32%) and advertising and subscription services (14% each). "Digital music is not developing as fast as expected," says Martin Olausson, director of digital media research at Strategy Analytics, in a statement. "While online revenues will expand further over the coming years, the overall size of the recorded music industry will continue to contract as record companies struggle to identify growth strategies." Such trends reflect a trend that started shortly after Apple (AAPL) introduced its first-generation iPod in 2001. By 2008, Apple passed Walmart (WMT) to become the largest music retailer in the U.S. 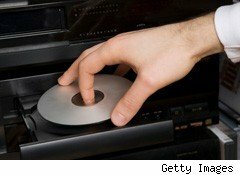 The Recording Industry Association of America (RIAA), which hasn't released 2010 numbers, said 2009 retail sales from physical media like compact discs and albums dropped 20% from a year earlier to $4.38 billion and more than offset a 19% jump in sales from digital sales. Overall, U.S. music sales fell 12% in 2009 to about $7.69 billion, according to the RIAA. Illegal music downloads have fallen off markedly since peer-to-peer (P2P) file-sharing giant LimeWire shut down in October 2010. The number of P2P users downloading music late last year fell almost 45% from three years earlier to about 16 million people, NPD Group said in a report released last week. Additionally, the typical P2P music user downloaded an average of 18 tracks during the fourth quarter of 2010, just half of the average from the fourth quarter of 2007, NPD Group said. "In the past, we've noted that hard-core peer-to-peer users would quickly move to other Web sites that offered illegal music file sharing," said Russ Crupnick, entertainment industry analyst for NPD, in a statement. "It will be interesting to see if services like Frostwire and Bittorrent take up the slack left by Limewire, or if peer-to-peer music downloaders instead move on to other modes of acquiring or listening to music." Regardless, such a trend towards digital and away from physical are being reflected globally as well. Worldwide music fans purchased $17.4 billion worth of music last year, marking an 8.4% drop from a year earlier and a 44% plunge from a peak number of $27.3 billion in both 1998 and 1999, as a plunge in compact-disc sales more than offset gains in digital revenue. PaidContent reported this week, citing a report from the International Federation of the Phonographic Industry (IFPI). Sales of physical media i.e. CDs, fell 14% last year and are just half their 2005 levels, according to the report.